Global Science and National Sovereignty: Studies in Historical Sociology of Science provides detailed case studies on how sovereignty has been constructed, reaffirmed, and transformed in the twentieth century by the construction of scientific disciplines, knowledge practices, and research objects. Interrogating the relationship of the sovereign power of the nation state to the scientist's expert knowledge as a legitimating – and sometimes challenging – force in contemporary society, this book provides a staggering range of case studies in its exploration of how different types of science have transformed our understanding of national sovereignty in the last century. From biochemical sciences in Russia, to nuclear science in the US and Europe, from economics in South Asia, to climatology in South America, each chapter demonstrates the role that scientists play in the creation of nation-states and international organizations. 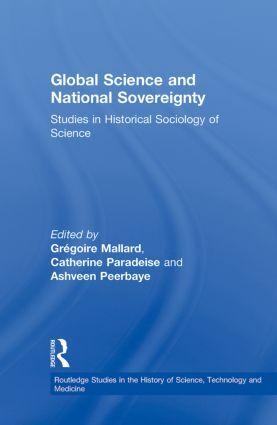 With an array of experts and scholars, the essays in Global Science and National Sovereignty: Studies in Historical Sociology of Science offer a complete redefinition of the modern concept of sovereignty and an illuminating reassessment of the role of science in political life.